The conclusion of "Game of Thrones" might not be ready anytime soon, the most watched TV show's final season could be out only in 2019. It is a long, long time for all "Game of Thrones" fans, but Casey Bloys the President of HBO stated that the showrunners need more time to conclude with the story. In a recent interview, Bloys said it would take a year and a half to finish the conclusion of the epic series. David Benioff and D. B Wess will have to write the ending episodes for the show's final season. Once the script is complete, the team will figure out the production schedule. It might be bad news for all "Game of Thrones" fans, but the long wait is believed to be worthwhile. The producers are trying to bring a "movie" feel to all its six final episodes. HBO plans on creating a prequel successor for "Game of Thrones," as George R.R. Martin has created a whole new world with his stories. Bloys stated there is enough material to make different prequels, and in time everything will take its course. Benioff and Wess, have huge plans for the prequels, it will be like a "Game of Thrones" universe. Probably a new story altogether, and now that the ideas are already taking their course, there is a possibility for a new series to arrive. When the final season of "Game of Thrones" is concluded Benioff and Wess would have had 12 years of work with them. As for Martin, he is continuing to write for the show. The 68-year-old American novelist has achieved more than he could imagine. Writing and filming "Game of Thrones" has not been an easy task, some of the writers need to coordinate with Martin. At the end, Martin would be reading the scripts and bring in alterations and ideas. "Game of Thrones" Season 8 is believed to be much bigger that Season 7, Bloys says the battles are going to be epic, and the crew has focused or bringing out a cinematic experience. 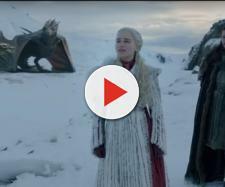 As everyone knows it already, the trailer for Season 7 already shows incredible battle scenes. There is going to be lots of killing and breathtaking experiences, "Game of Thrones" is known for its surprises, and they promise to bring out an unforgettable Season on July 16, 2017. The season is said to conclude six weeks later on August 27. At this moment, the crew is strongly focusing on Season 7 and 8, plus they have not touched upon any prequels. There is nothing known about the same cast for the prequels, there have been rumors that Ned Stark might play a role in one of its shows.